With personal debt on the rise, many Australians are struggling with their finances. In most cases, a repayment plan can be worked out to get you back in the black. If that’s not feasible, another solution can be to declare bankruptcy, but this can have serious implications if you are running your own small business. Bankruptcy only applies to individuals (not their business) and is a legal declaration you are unable to pay your debts. Once you declare bankruptcy, all your ‘provable’ unsecured debts like credit cards, personal loans and even tax debts are no longer payable. However, bankruptcy is never a step to take lightly, as it has significant consequences. Bankrupts cannot be a director or otherwise manage a corporation, and many professional bodies and trade associations restrict you from membership (which you may need to operate your business), during bankruptcy. If you are in a business partnership and declare bankruptcy, the partnership is automatically dissolved. Although you become bankrupt, the business itself doesn’t become bankrupt. Even though bankruptcy prevents you from being a company director or secretary for the term of your bankruptcy, you can still operate a business as a sole trader. If you have an existing ABN, your Trustee will advise the ATO and it will note the date of your bankruptcy against your ABN. If you plan to use your ABN to continue as a sole trader, you will need to arrange for your ABN to be reactivated. There is no restriction on applying for an ABN after becoming bankrupt. Operating under your own name as a sole trader can be an option if you are bankrupt because you don’t have to tell anyone. If you trade under a business name or assumed name, you are required to disclose your bankruptcy status to everyone you deal with. Not doing so is an offence under the Bankruptcy Act. 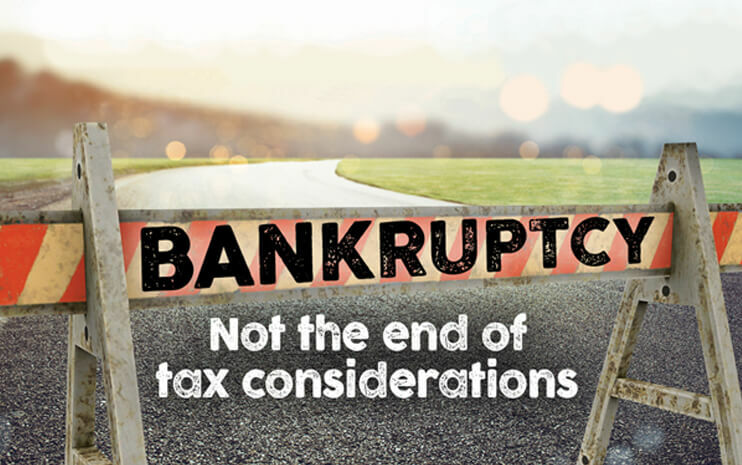 While declaring bankruptcy can offer a way through your financial difficulties, your obligations under the tax law don’t disappear. You still need to lodge a tax return and if you have not lodged one for some time, the ATO usually requires your Trustee to rectify this. Outstanding personal returns and Business Activity Statements (BAS) will need to be filed, or the ATO may issue a default assessment. If you continue to operate as a sole trader during your bankruptcy, you are still required to lodge your normal quarterly BAS statement. Where the ATO is a creditor of your bankruptcy, the Trustee may not pay this debt first, as the ATO ranks equally with other unsecured creditors. If the Trustee decides to sell some of your assets to clear your debts, this may create a capital gain or loss which will need to be recorded in your annual tax return. Tax law considers this type of sale to be made by you, not the Trustee, so you may have a capital gains tax (CGT) liability. In general, you must inform your Trustee if you become entitled to a tax refund during bankruptcy. If you owe a tax debt, the ATO can retain a refund to pay it, or a debt owed for child support or family assistance. Tax refunds for income earned after you became bankrupt are considered part of your assessable income and your Trustee may use them to make compulsory creditor payments. Generally, you can’t claim a tax loss incurred before or while you are in bankruptcy in a subsequent tax return. This rule is designed to stop bankrupts from claiming tax deductions for debts they are no longer required to pay. If you are experiencing financial difficulties, call us to discuss your options.